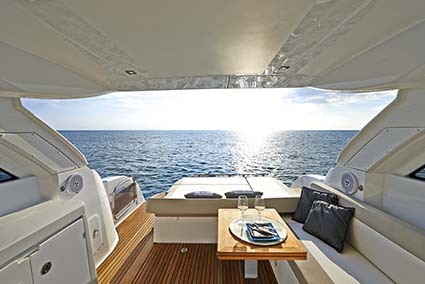 Modern sportscruisers like the new Jeanneau Leader 40 successfully combine high-speed powerboating with wind-in-your-hair exhilaration or sheltered motoring. Making a splash in the competitive luxury sportscruiser category isn’t easy but the sterndriven Jeanneau Leader 40 motoryacht has the performance and liveability to mix it up with the best. 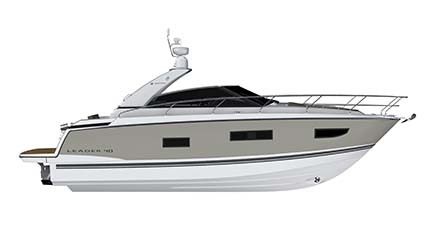 The two-cabin Jeanneau Leader 40 is the new flagship sportscruiser of a range comprising the Jeanneau Leader 8, 9 and 10. 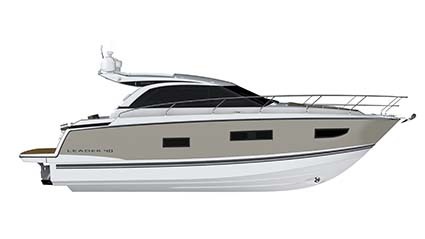 It enters a competitive market segment that includes the very similar Bavaria Sport 39 and, for those with deeper pockets, the well-established Portofino 40 from Sunseeker. Stepping aboard hull #1 via the teak swimplatform, the first thing that struck me was the open-plan deck layout. I can envisage a couple of families easily enjoying a day on the water, thanks to the wide transom seating, L-shaped chaise lounge, plus twin sunpads on the bow. 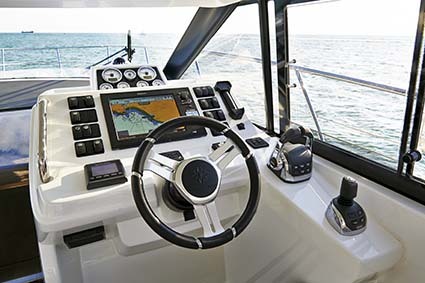 Stepping up to the steering console should give skippers of varying heights good views all-round. The console has a lot of shiny GRP exposed, reflecting a fair bit of glare, which was the only detraction from an otherwise clearly laid-out area. The important analogue engine dials are high up at eye level, while the Simrad NSS 12 plotter is central and surrounded by chunky system buttons. Looking around the cabin with my colleague Lori who tried out the chaise lounge, we were slightly puzzled by its L-shaped cushioning that prevented two sets of legs from resting; perhaps an infill would be better rather than the fixed chaise. Moving aft to the lounge area the movable backseat creates a large sunpad – definitely the place to be at rest on the Leader. Alfresco dining should be enjoyable with the folding teak table near the wetbar grill and fridge opposite. The transom has ample locker space for water toys and a liferaft in the main lazarette, which is well secured with twin locks, plus there’s another fairly deep side locker nearby. The swimplatform can take a rubber ducky or several doughnuts with ease and the hydraulic option makes launching of watercraft child’s play. 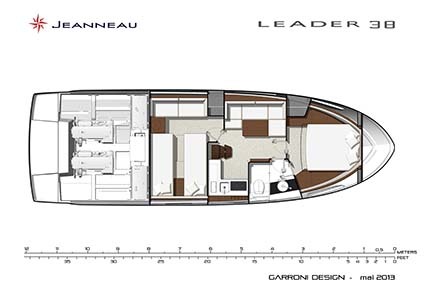 Below decks you find the classic sportscruiser two-cabin layout with compact galley and dinette. But Italian interior design firm Garroni has really eked out the space to create two exra-spacious cabins. Versatility is in abundance in both double cabins – such as the retracting bed-end in the owner’s V-berth and the infill in the second cabin that creates a king-size double from the two singles. In fact, for those long coastal hops, I’d choose the aft double for its kinder motion underway with that large double bed in mind. 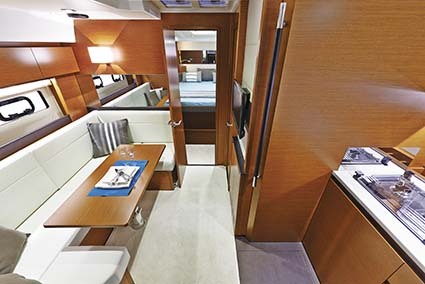 Privacy is also good thanks to the dinette-galley area separating the two cabins. The compact galley is starboard and nicely fitted-out with ceramic hob, deep sink, icebox and front-opening fridge with plenty of worktop space. Overhead lockers and drawers below the sink ensure adequate storage, while underfoot are bilge baskets to keep the wine at a stable temperate. Cocktail hour could last even longer thanks to the tall cabinet with glass holders nearby as well. The only obvious niggle is the rather small opening portlight for when the cook is on the job. Across the floor, the dinette comfortably seats four on its hard-wearing vinyl cushions while, when the kids have had enough sun, the large table retracts to become a snug daybed. From there you can also lie back and enjoy the flatscreen television neatly inserted in the bulkhead above the cocktail cabinet. The bathroom adjoins the owner’s cabin, so is handily located and is spacious. 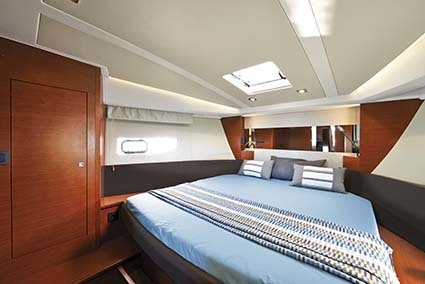 Stepping into the forward owner’s cabin reveals a fairly conventional bed layout, with wood surrounds requiring you to climb into it from the bottom – but as mentioned, the retractable end frees up space to move in. Ventilation is adequate with the rectangular windows having opening portholes and the forward-opening skylight to give airflow at anchor. For storage there is a single hanging locker, plus longitudinal shelves for books, with LED spotlights to enjoy a night-time read. Looking more closely at the aft cabin reveals more positives, including a bench seat and a smaller moveable one below the storage cabinet, so the space is well used. Ventilation is adequate to avoid that claustrophobic feeling among guests new to boating with twin opening portlights and a similar skylight. The hull is built for sterndrives, with a choice of petrol MerCruisers or diesel Volvo Pentas and two power options in both. Our test boat, hull #1 of the Open Top range, came with upgraded 370hp Volvo Penta D6 sterndrives. The twin Volvo sterndrive installations have been fitted with the popular joystick docking system since 2010 and are a good option for easy handling. On sterndrives, this allows both engine legs to move independently of one another and even tilt as dictated by the black box; and each has a hydraulic drive with throttle box as part of the joystick system. Similar to the Volvo IPS system that has been around since 2005, the joystick has two power modes (1750rpm and 2150rpm) and the manoeuvrability of the system negates the need for a bowthruster. I’ve used it on other powerboats and its intuitive use of twisting (to turn) and moving in the direction you wish to travel feels natural. It actually works by turning one sterndrive to port with forward thrust and turning the other to starboard with reverse thrust, allowing the joystick system to push the hull sideways to starboard, or vice versa. The power is based on how far the joystick is pushed. There’s also inbuilt redundancy, as both engines run using their own electronics with separate hydraulics as well. 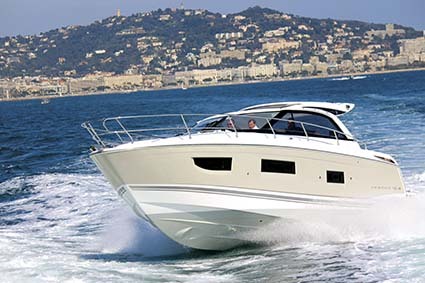 The Jeanneau Leader 40 exudes that get-up-and-go feel when you take the wheel. Of course there’s the joystick control for easing out of a tight marina berth. 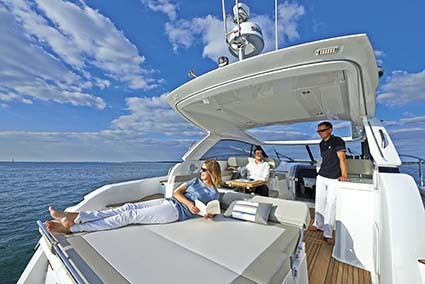 Compared with enclosed cabin cruisers, the Jeanneau Leader’s engines are more audible, but that’s all part of the sportscruiser package that puts you out among the elements. Just unclip the straps of the canvas/plastic bimini to enjoy the sunshine. Apart from the rising roar of the twin engines, there is no unwanted wind noise from the canvas canopy. The steering has enough feel to make handling the Jeanneau Leader interesting but the sharp turning and grip of the hull feels good – in fact much better than some Volvo pod-driven boats I’ve recently tested. All credit of course to the sleek Michael Peters-designed hull with its classic raked lines and full bow that cut through the chop, but with enough buoyancy to avoid slamming. Crossing the wake of our sister Jeanneau Leader 40 Sport Top produced plenty of spray, yet none landed on our decks thanks to the right amount of bow flare. The Jeanneau Leader encouraged me to go for tighter and tighter turns, as even heeled-over visibility was good through the window and plastic roof. Towing a water toy would also be easy as the views aft are unobstructed. For performance, our notes showed we reached 32kts with the revs maxed-out at 3350rpm with fuel consumption at 151lt/h – the speed was a wee bit less than the company’s expected top of 38kts but we did have five people aboard. Throttling back to a thriftier 25kts brought the fuel burn down to 78.6lt/h, giving a useful cruising range of 230 miles. 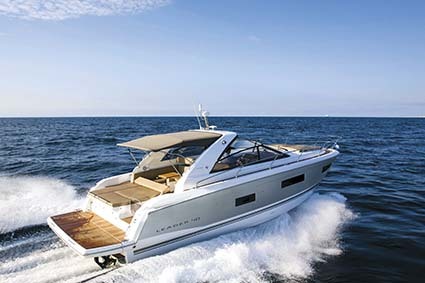 After thoroughly reviewing the Jeanneau Leader 40, just one question remained – to choose the Lead Open or the Leader Sport Top model? Speaking to NSW dealer Matthew Willett on that topic gave me the answer. "Both models are ideal for our Australian climate and for our love of sun and water, but the first one [I brought in] for the Sydney boat show is the Sport Top," he revealed. *Sea-trial data supplied by the author. Fuel burn is total for both engines.